"To go from nothing to marathon fitness in 4 months is nothing short of amazing. It has been great fun for me to give advice to Al since April and be a "virtual coach". It was also a pleasure running alongside him yesterday on the big day as he is such a great bloke - friendly, decent and down to earth. We had a right old laugh this weekend. Although he got a cracking time for a first attempt (4:16) I was personally impressed with the fact he had a really strong race. He ran fast but always within his limits. At no point in the last few gruelling miles did it fall apart and you could tell from the determination on his face that he was not going to let the distance beat him. He really did himself proud. 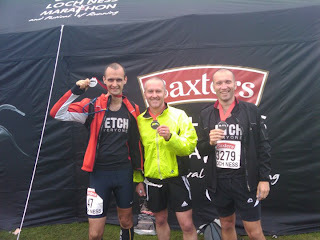 And we did a sprint finish over the line :)"
Mike also got a huge PB at Loch Ness of 3:26. Fantastic stuff. Since then I have been considering my options for next year and how I finish this one. I am drawn to trail runs, especially the longer events, however the waters were muddied by getting an entrance to the London Marathon next year. I have decided to pay for it but defer running it until 2012 thereby allowing me to chase my goal of 5 Scottish Ultras in 2011. Then I'll be looking to increase my long runs in the New Year to prepare for the Dee33 in March. Also trying to lose a good bit of weight. This is ongoing and looking promising.